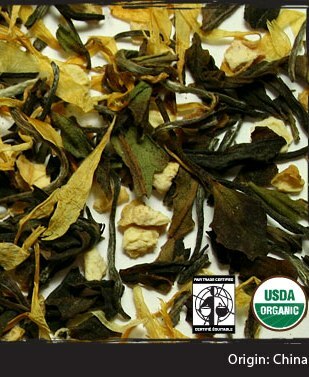 Organic white tea, organic osthmanthus flowers, organic jasmine flowers, natural peach flavor and natural essential oils of orange and tangerine blended in the U.S. Flavor Profile: Consummately floral, with notes of fresh citrus, white peach, white pepper, toasted amaranth and a trace of fresh blueberries. 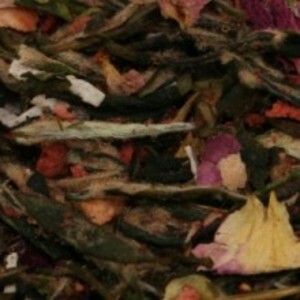 This is a beautifully floral tea – I love how well the jasmine and the osmanthus work together. It creates a light and lively flower-y essence that is not sharp like some floral notes can be, and because of the fruit-like flavors of the osmanthus, the flavors here do not come across as soapy. The white tea is very delicate here. There is a whisper of vegetation to this tea that is barely there, mostly what I taste from the tea is the white tea sweetness with a hint of spice. It sits in the background, making its presence known without being too obsequious. The peach flavor is the real star – I love how it shines through! It tastes like a fresh, ripe peach, bursting with flavor! 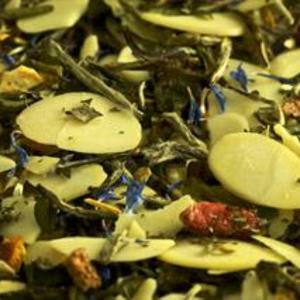 The citrus tones of this tea bring a little tangy flavor to the cup, just enough tart to keep it from being too sweet. This is a lovely white tea. It is one that was sold out at the time that I wrote this review, I do hope that the supply will be replenished. It is a fantastic springtime tea! 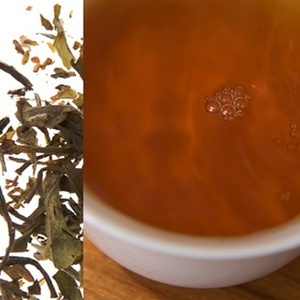 This blend just might give you the edge you need to stay healthy this fall. 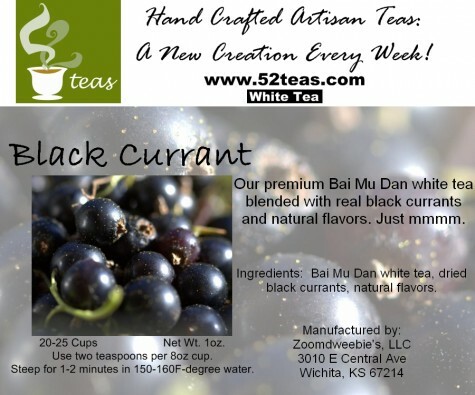 It’s a white Bai Mu Dan, so it’s naturally high in immunity-enhancing antioxidants. Plus it contains licorice and goji berries, a Chinese wonderfood reputed to have 500 times more vitamin C than oranges. The best part? The almonds and cocoa nibs. They don’t fight colds, but they make this an amazingly tasty weapon of choice. 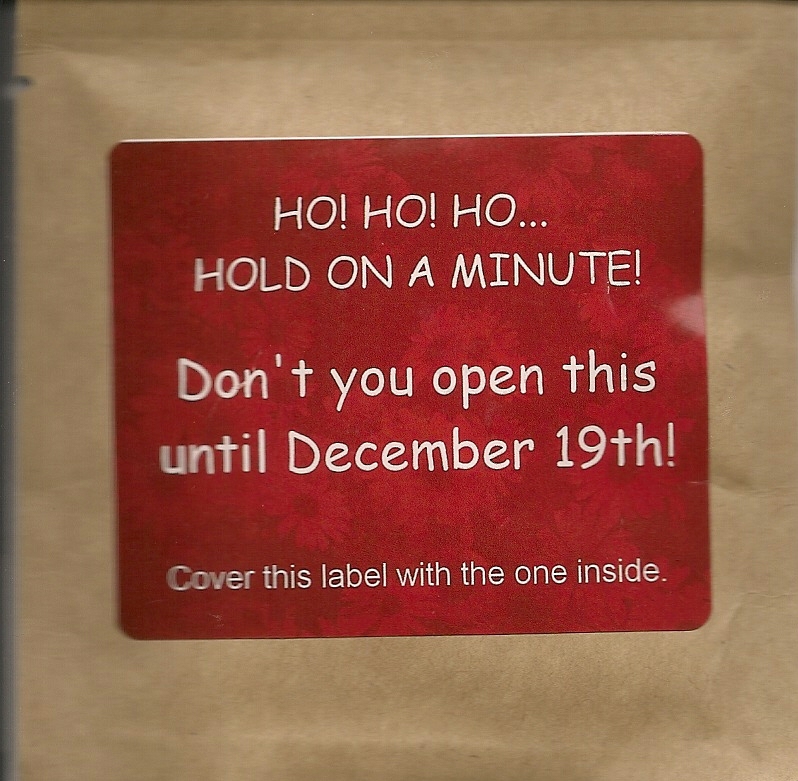 Upon opening the package this smells like nuts! Lots and Lots of Nuts! Almost a peanut butter type aroma. Underneath I can smell a little fruit and even less flower-likeness. I’m not gonna lie…I stole an almond sliver before infusing…it was tasty! After infusion this smelled like almond but more mellow. I can also taste the Goji Berries slightly. 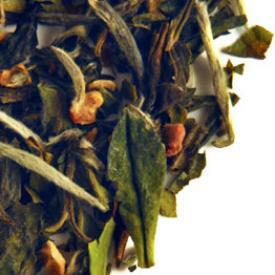 The white tea itself has a great clean flavor! I can’t really taste the licorice much…but that’s ok with me…oh wait! There it is…it’s “on the assist” and on to the aftertaste…but only a hint! It seems to squeak it’s way in there! This is a creative and comforting blend! It’s fun and unique! I’m very happy about this tea it seems to be the full package! Good and good FOR you! This tea takes its name from its silvery, unopened buds. It has a delicate, ethereal flavor that builds on the palette with each sip. It amazes me how different white tea can taste from tea company to tea company, even when dealing with the same type (White Peony or Bai Mu Dan) of white tea. This White Peony from Frontier Co-Op possesses a surprisingly earthy scent that reminds me of a the smell of a damp, musty wood with hints of moss and earth. The taste is fresh and sweet. It is a delicate flavor but it is one that develops as I make my way down the cup. At the start, I found it to be quite delicate but now as I am near the end of the cup, I’m finding it to be really flavorful. There are pleasant fruit-like flavors and a slight vegetative quality to the cup. And like the scent suggests, there are also interesting woodsy tones to the flavor, as well as a slight earthy taste. It isn’t overwhelming and it adds to the intrigue of the cup. 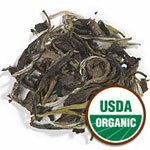 An enchanting cup of white tea, this White Peony from Frontier Co-Op! This tea smells nice – especially the brewed liquor! The strawberry scent is strong, there is a leafy element and a hint of flower too. Beautiful. It would make a lovely bath tea… but I made this tea to drink! I can taste the sweet, juicy taste of the strawberry. It is just a little tart… but this is a very delicate tart note – perhaps the most delicate tartness that I’ve encountered in a strawberry blend to date. Rather than that “berry tingle” (as I often call it), it is more like a “berry kiss” on the tip of the tongue. Very nice! I can also taste the leafy sweetness of the white tea. It is vaguely vegetative with distant floral notes. There is no bitterness (I think you can just set this to brew and forget about it, come back to it 10 minutes later and it still wouldn’t be bitter – just as long as the water isn’t too hot!) and very little astringency. This tea is a beautiful marriage of flavors. It is delicious served hot or iced. However, if you choose to ice it (and you should – it’s really thirst quenching!) I recommend adding just a pinch of sugar or other natural sweetener (such as honey or agave nectar) to perk up the flavors just a bit, as the chill does have a slight muting effect on this tea. This is a really delicious strawberry tea. I’m so glad that I chose to sip this today… as the skies are turning gray it is nice to have this lovely “kiss” of summer in my teacup!